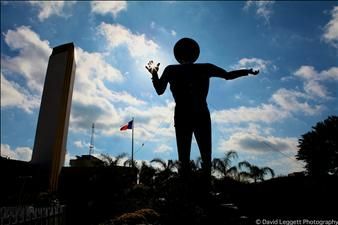 An October 19th fire brought an end to Big Tex’s reign as the most recognizable icon of the State Fair of Texas. When the story broke, Dallas Morning News created an online obituary and Guest Book for him. Condolences and memories started pouring in from fans across the country. What’s special about this story? Big Tex was a fictional character – a 52-foot tall statue. And I have to say, that’s a first for Legacy.com. Our team of screeners got busy reviewing condolence messages, and quickly discovered this was no ordinary Guest Book. I’ll always remember his last words: “Howdy, y’all! Is it hot today, or is it just me?” Sadly, it was just him. I remember the time Big Tex pointed me in the right direction when I was looking for the restrooms. Alas, poor Big Tex; I knew him. How will I ever find my way from the livestock buildings to the Midway without him to point the way? How will I catch the pig races without him announcing their schedule? I just don’t know. I’ve always been the odd man out when it came to a lot of things. But, when I went to the fair and saw big tex when I was little it always had a way of making me feel like I wasn’t alone and proud to be TEXAN. I’ll miss you big guy shame I couldn’t see you one last time before passed. When i first moved to Texas, i was 13, it was in 1958..he was the first thing i saw, and i remember thinking “wow everything is so big in Texas”. They might rebuild him, but he will never be the same. Tex, when I was little and we went to the Fair…I knew if I got lost I was supposed to go to you and sit at your feet. When I got older and had kids of my own, my kids knew to do the same thing. There was only one time I had to go to your feet to retrieve someone. Thanks for always being there for us. You were always our rock. This entry was posted in Legacy.com Remembers and tagged Condolences, Guest Book entries, Interesting obituaries, Life at Legacy.com, Obituary Guest Books. Bookmark the permalink.